And just like that... harvest season is underway! The veggies are ahead of schedule, probably due to all the sunshine and warm temps this spring. Normally we're pacing around, worried if certain crops will be ready for the first CSA Harvest so when we noticed things were ready ahead of time we were pleasantly surprised and decided we needed to start the CSA a week early. The first CSA Harvest of the 2018 season is complete and included the following: Carrots, Salad Greens Arugula, Baby Kale, Snow Peas, Radishes, Mustard Greens and Green Garlic. It was so great to see all of our wonderful CSA Members in Telluride on Wednesday and at the farm in Mancos yesterday! Thank you for reminding us why we do what we do! Seeing you're faces and excitement about the produce this week gave me a boost of energy that should carry me through these hot windy days! Thank you for supporting local agriculture and being a part of our farm this season. We truly look forward to sharing the harvests and seeing you all every week from now to October. Mike seeded the root block (carrots, beets, turnips and rutabagas) earlier in the week and is managing the irrigation to get these crops to germinate quickly in this hot weather! Tomorrow we will be seeding the zucchini, winter squash and greens beans and then the farm is mostly planted for the season, not counting the continued successions of greens, radishes, cilantro, etc. It's almost time to switch from planting/seeding mode to weeding mode! I started weeding the onions beds yesterday and we're planning to finish them today. Currently... 3 beds down and 9 to go! If there's any one crop that needs us to stay on top of the weeds, it's the onions. They grow pretty slow and do not offer much competition early on for the weeds and they can get swallowed fast. We're planning to start pruning and trellising the tomatoes this weekend. They're growing like weeds and looking a bit out of control at the moment. It will feel good to tidy up the tomato beds and give them some direction. They're flowering and looking strong... it currently feels like it could be a good (and maybe early?) tomato season! Here's the triticale and vetch block during sunset! We splurged earlier in the spring and ordered an 8' roller crimper, and it got delivered yesterday afternoon! Wahoo! Basically, it's a large and heavy cylinder that we pull behind the tractor and it rolls (crimps) the cover crop flat on the ground, terminating the cover crop and laying it all down as mulch. We're going to take it for a test run on Sunday morning and crimp this block of cover crop. We'll report back with photos and info on how this goes, as well as our long term plans/ideas with this piece of equipment. Water is ON and Harvests Start in 2 Weeks! Our irrigation water is officially ON, which means we're suddenly planting all the things! We spent Wednesday transplanting cabbages, cauliflower and broccoli. They're getting settled into their new space and looking good. We finished planting the greenhouses over the weekend. We had a few open beds that we filled with with shishito peppers, eggplant, cucumbers and more cherry tomatoes! And, the first round of tomatoes are ready for a pruning and trellis... we plan to tackle that next week. We have this lovely bed of overwintered collards that are blooming and attracting so many beneficials. We were supposed to pull these plants out months ago but I'm glad we procrastinated and let them flower because now they are truly buzzing with life! Mike spent some time earlier in the week prepping the beds for beets, carrots, rutabaga and winter squash. It took a couple years of making adjustments but I think we have the bed shaper dialed! Mmmmm, the soil in this block feels great and I'm excited to seed beets early next week! In the fall, after we harvest crops, we normally incorporate the crop residue and then pull the grain drill through the field and seed a cover crop to protect the soil during the winter months. Last season, the only two blocks of cover crop that germinated in the Fall were the ones seeded in early September. We were able to irrigate these blocks once or twice and they enjoyed the last rain storm we had in mid-September. We rely on rainfall to get most of the cover crop up, and last fall that just didn't happen. We're excited these two blocks of triticale and vetch survived the winter, and the last incredibly dry 8 months. They're getting a touch of irrigation now and we plan to crimp them with a roller crimper soon! Stay tuned! OK. I should head outside and open the greenhouses. We're looking forward to seeing all of our wonderful CSA Members in less than 2 weeks! CSA Countdown - Harvests Start in 3 Weeks! We're tackling one day at a time over here, with healthy to-do lists and endless water and snack breaks. It's been a hot and windy week and staying hydrated has been a challenge. The weather feels more like what we expect in June, rather than May. But, most of the crops we have in the ground seem to be liking the hot days and mild nights. The tomatoes are growing like weeds in the greenhouses and we transplanted two beds of peppers earlier in the week to keep them company. The peppers settled right in and already have ladybugs nestled against their glossy leaves. We are planning to finish planting the greenhouses tomorrow morning, with cherry tomatoes, eggplant, shishito peppers and more basil! We spent a couple days getting the weeds in check. They're back and happy as ever and they do not seem phased by the drought... the thistle just seems sharper earlier than normal! Rhubarb! and herbs herbs herbs. I have been wanting to start establishing perennial beds for a couple years now and the slower pace of this year has actually allowed it to happen! We planted a bed of rhubarb root stock from some of my lovely friends and mentors at Circle A Gardens in Montrose! Thanks Betsy!!! And an herb bed filled with mint, thyme, oregano, sage, etc... Things are about to get more flavorful around here! Herbs = FLAVOR, in everything from rice bowls to peach pie. We're excited for CSA Harvests to start the first week of June! We only have a few Summer CSA Shares left, so make sure to sign up ASAP to reserve your veggies for the season! Ok, we should get back to it. We're headed out to prep beds and transplant kale this afternoon! Warm Temps and Hopeful Plantings! The pace is picking up around here, and with it the heat! Holy moly, we have been in the 80s the last few days and our bodies are trying to acclimate. The heat feels good but seems a bit early? We LOVED the storm that brought a little rain and cool temps to Southwest Colorado last week! The soil was wet for a day or two and we got to spend a couple days organizing, cleaning and catching up on emails. I grew up with a father who always kept his garage and tools incredibly clean and organized. Every tool had a place. He knew (and still knows) where every tool was, and also if something was missing. I would borrow tools here and there and sometimes forget to return them. Within a day he would notice something missing and ask, 'Hey, did you borrow a wrench yesterday?'. I'm working on getting our tools organized like this, and find it so satisfying when we have the tool to fix or repair something AND I know exactly where it is. Planting season is suddenly in full swing! The first round of tomatoes went in on Friday and Saturday. They're settling into their new spacious beds and already starting to put on new growth. We're hardening off the eggplant and peppers and hoping to transplant those in the next week or so, depending on what the 10-day forecast looks like. I feel like we should have one more cool/cold dip before the end of the month but we'll see, that might not be the case this year? We have started planting the onions! The Sweet Walla Walla Onions and the red storage onions are. Today we're going to finish up planting with the yellow storage onions, leeks and scallions. The onions and the potatoes, which went in on Sunday, are both hopeful plantings. We will be able to get the onions established with irrigation water, but we will need rain to come this Summer to pull them through to the end of the season. Fingers crossed! It feels like a gamble but, it will help us learn and understand what we can produce on a season like this. We're going to learn a lot this season when it comes to crops and drought stress... We'll be taking lots of notes! We transplanted the first round of head lettuce, more little gem lettuces, chard, bok choy and napa cabbage yesterday! We still have a prop house full of starts and are slowly working our way towards getting everything transplanted. I think we'll start in on the brassicas next week - the cabbages, kale, collards, cauliflower and broccoli! It feels good to see starts moving out of the propagation house and into the field. The early carrots are looking great! They should be ready for the first CSA Harvest, which is only 4 weeks away! The beets are gorgeous as well, and need a good thinning so they can start to really bulb up. OK. We need to head out and catch up on a couple weeding projects, shape beds and get the rest of these onions in the ground! We're moving slower at the farm this morning, savoring the dark clouds and drizzling rain. RAIN, oh my gosh, it feels so refreshing outside! It rained (lightly) last night, and we're hoping it continues throughout the day. Either way, we're grateful for some moisture. I just came in from checking on the propagation house. All of our starts are looking great and are about ready to make their way into the field and greenhouses. We have a few plantings on the schedule for later in the week: potatoes, onions, tomatoes and various greens. It's the first real planting push of the season and I'm excited to get all of these starts in the ground. We successfully moved the two Moveable Tunnels on Friday! This is a nice task to have complete and thankfully the skies stayed calm while we pulled the tunnels across the field. I have nightmares of wind gusts tossing them around. So, these tunnels are all set up in their Summer Plots and are prepped for planting tomatoes on Saturday. The early carrots and beets are now out in the open enjoying the sunshine, wind and rain! We have row cover set up to keep these lovelies warm as the temperatures drop over the next few nights. WATER UPDATE: We want to keep our CSA Community up to date on what our irrigation season is looking like for 2018. As we all know we're in a drought, one that they're now labeling as 'exceptional' in Southwest Colorado. The latest drought map put out by the U.S. Drought Monitor shows a painful dark red, representing the drought intensity as D4 (exceptional drought), covering our corner of the state. Our irrigation water, which we use to irrigate your vegetable crops, comes from snowpack runoff in the mountains. We anticipate our irrigation water is going to be shut off come the first hay cut in our valley, which usually happens early July, and then it may come back on sporadically here and there. This is scary for us, but not surprising, considering how dry it has been. When if feels like we did not have a winter, it's impressive we have any irrigation water. We will keep you all posted as the season progresses and as we learn more. We want to extend a HUGE THANK YOU to all of our CSA Members! Thank you so much for supporting local agriculture and for believing in us to grow your vegetables! We take our role as farmers very seriously. Please know that we are going to do our very best to provide a bountiful and steady supply of produce to you all this season. Please also keep in mind that the weather is out of our control. I have reminded friends and fellow farmers recently that every time we plant a seed there is an element of hope involved. As farmers, we have to have hope every time we seed and plant. Hope that our crop(s) will not be knocked out by pest pressure, disease, a hail storm, etc. And this year, we just need to have an extra level of hope. Hope that rain will come, sooner or later. This season is challenging Mike and I in new ways. I feel like spring is normally a very physically challenging time of the year, but this spring, it's more of a mental and emotional game. Ultimately we believe this is going to make us better farmers. It's going to force us to evaluate how we can be resilient and care for our soil during dry spells like this. Thank you for reading! Keep your fingers crossed for rain and have a wonderful day. Spring has arrived. Birds are up early signing along the fenceline, grass and fields are beginning to green up, the longer days are refreshing and most evenings a beautiful sunset will stop us in our tracks! With the arrival of Spring we're slowly seeding all the things! The tomatoes, peppers and eggplant are beginning to fill out their trays and will be ready for repotting here shortly. The first round of lettuces are up and we filled the propagation house with newly seeded trays on Saturday afternoon. We seeded trays of kale, collards, chard, cabbages, kohlrabi, cauliflower, broccoli, lettuces, parsley, basil and fennel. This Spring has a very different feeling than last year, partly because it doesn't feel like we had a Winter? We are planning and seeding mainly for our CSA Community this season and scaling back our wholesale production considerably, due to the incredibly dry Fall and Winter and knowing our irrigation season is going to be short. This is a big change for us and our farm as wholesale production has been our main focus for years. We are looking at the bright side, knowing that less production means more down time this summer. So we should have more time for friends and family, and be able to prepare dinner at a reasonable hour and maybe spend the weekends hiking and BBQing rather than working in the field. Mike and several other farmers in Southwest Colorado were recently interviewed by Luke Runyon with KUNC 91.5fm about drought, conservation and resilience in the Colorado River Basin. Drought is viewed as a temporary situation but what do we call a condition of permanent water impermanence and a need to be constantly resilient? When Drought Lasts 18 Years, Does it Need a New Name? As Brad Udall was quoted saying, "If you have the wrong words in your thoughts, you might actually come up with the wrong solutions." Farm Updates! 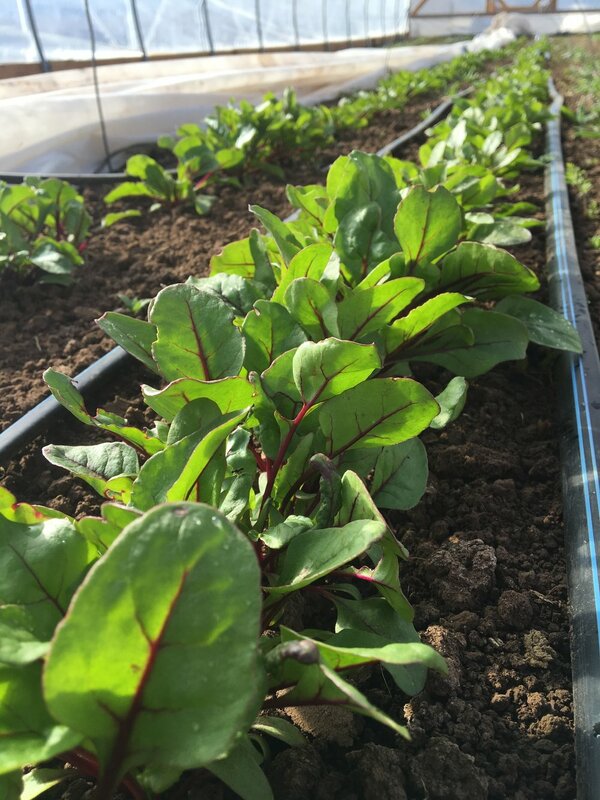 Beets and carrots are really starting to take off in the moveable tunnel, the onion starts are beginning to bulk up and the first peas and turnips are up in the greenhouse! Grow lovelies, grow! This will be our first season with the moveable tunnels up and running for a whole year... this gives us the opportunity to seed roots (such as carrots and beets) early and come May we will pull the tunnels to their 'Summer Plots' where we will plant crops like tomatoes, peppers and basil that will benefit from the additional heat during the summer months. At the same time, those early carrots and beets should be able to handle the Spring weather and temps and hopefully be ready for our first CSA Harvests! Having moveable tunnels and being able to use them like this has been a dream of mine for years as crop rotation in greenhouses and high tunnels can be challenging. Being able to move these tunnels onto three different plots throughout the seasons will provide many more crop rotation options without pulling expensive 'greenhouse real estate' out of production. We are experimenting with a couple things this year.. We experiment every season but this season just has a different focus... a drought focus. One of our experiments is with potatoes. We're going to follow advice from some of our mentors in the area and try an acre of dry land potato. Yep, you read that right. We are not sure how the potatoes will do or what kind of yield we'll have, but we'll report back as the season progresses. Always learning. Mike has been processing Hubbard squash seed! We love this variety for so many reasons... it's diversity in shape, color and size, it's sweet rich flavor, drought tolerance and it's ability to store well for 8+ months. We appreciate the many farmers and their seed saving work on this variety for the past few hundred years. We have these farmers/seed savers to thank for a squash that is resilient and truly adapted to our region. CSA Registration is OPEN! We would love to have you join us and our farm this season, for 18 weeks of freshly harvested produce grown right here on this beautiful piece of land we call home. First, review the Summer CSA details and options. Summer CSA Registration is OPEN! We are opening registration for the 2018 Mountain Roots Produce Summer CSA today! We're currently preparing and planning for another growing season and we are seeding the first seeds of the season this afternoon. We would love to have you join us and our farm this season, for 18-28 weeks of freshly harvested produce grown right here on this beautiful piece of land we call home. Thank you so much for your support! I love the CSA model, I love planning the season with YOU in mind and knowing that we will get to see and connect with our CSA members every week. January at the Farm AND 2018 CSA Info is Up! We hope winter is treating everybody well. It's shaping up to be an odd one... and we're curious to see what the next few months will bring in the form of moisture to Southwest Colorado. We just posted the 2018 Summer CSA Details, check it out! 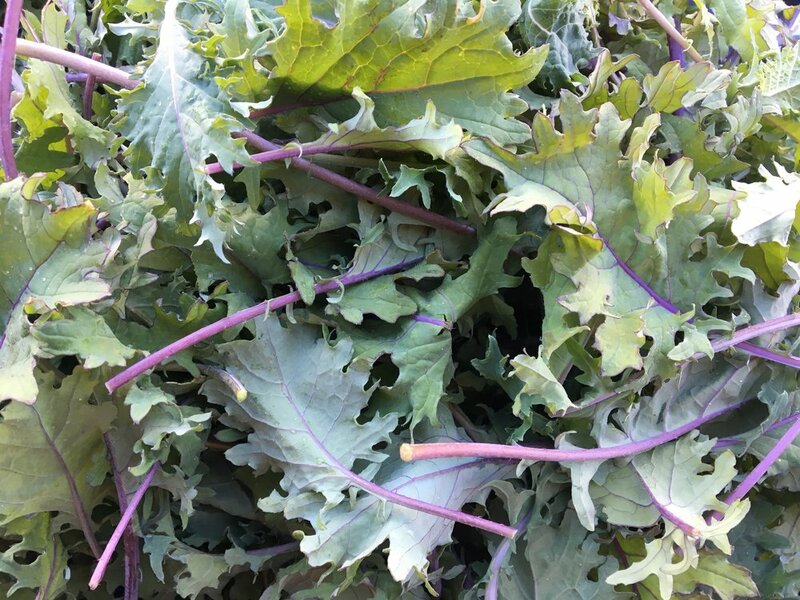 We are excited to offer both a Mancos CSA Share and a Telluride CSA Share this season! Registration Opens February 1st, so mark your calendars or sign up for the CSA Waiting List and we will send you a reminder email the morning registration opens. Winter is an interesting time at the farm. It brings time for rest and recuperation and time to catch up with family and friends. We have been spending hours at the computer, working on the 2018 financial projections, updating the CSA details, placing our seed orders, drafting the crop plan (which always changes but you need to start somewhere), reviewing our 2017 notes, ordering tractor implements, writing down our goals for the year and discussing how we can improve our systems and efficiencies at the farm as well as our work/life balance. All accompanied with many cups of coffee, pancakes, a fair amount of procrastination and compromise. I spend a lot of time in the winter contemplating how can we make the CSA experience even better for YOU. This is a partnership after all and we want to continue to grow this CSA Community year after year, and we hope you’ll join us in that endeavor. I will be reaching out to some of our CSA Members this month with my ideas but please contact me directly if you have some thoughts. We would love to hear from you! We are prepping two of the greenhouse beds this week for planting the first seeds of the 2018 season… the onions, scallions, leeks and shallots (aka the alliums)! We start these in the greenhouse beds in January, where they’ll germinate slowly but grow into stocky transplants over the next few months. In early May we will dig them out of the greenhouse beds, give them a quick trim and then transplant in the field. Here they will be weeded several times, irrigated regularly and then harvested once their tops begin to fall in September. The onions and leeks are two of the longest season crops we grow but also one of our favorites, as the majority of the meals we prepare here at the farm start with peeling an onion. We are starting the 2018 Seed Order today! I have been flipping through seed catalogs and getting ideas but I haven't truly dived in yet. It's time, time to start dreaming up the season, planning and hoping for bountiful harvests and taking the first step, making the crop plan and ordering the seeds! In a couple months we will be seeding early roots in the moveable houses and starting the tomatoes and peppers in the propagation house We can hardly wait! We have our tried and true favorites for most crops, but we're always trying new varieties. Year after year we grow/trial and observe various varieties and slowly pick out the ones that perform best at our farm. Growing at 7200' in Southwest Colorado brings it's challenges and finding the varieties that thrive in this high desert climate is critical. If you haven’t already, check out the Mountain Roots Produce 2017 Year in Review… via our 2017 Photo Gallery! We made a compilation of our favorite photos from the season and it’s pretty amazing how much we can make happen if we put our minds together and help each other focus and troubleshoot along the way. We'll check back on February 1, 2018 when CSA Registration begins! Until then, review the updated 2018 Summer CSA details and contact me if you have any questions! Happy Holidays and Recap of the 2017 Season! We are wrapping up the 2017 season this week! It is hard to grasp how fast this year has flown by, as it feels like just yesterday I was whispering sweet things to the tomatoes, encouraging them to ripen. I recently scanned through our photos from the year and am overwhelmed with satisfaction when I look at how much we grew this year and how much we accomplished. 2017 will go down as the 'Year of Infrastructure' at our farm. We put up the game fence, built a prop house and built two moveable greenhouses in the spring. Then in August, right when the nonstop harvests were starting to kick in, we began the construction of our wash/pack/storage warehouse. No wonder a recurring comment this season was ‘can we just farm next year…?’. We may have but a few too many projects on our list this year, but we did it with the help and support of our friends and family members, whom we cannot thank enough! And now we're set up for some serious organization and streamlining in 2018! We are excited and ready for the slow down of the next couple months. Our bodies and minds will appreciate this time to rest and recuperate from the growing season. Next month we will begin to reflect on the 2017 season and contemplate how to improve our systems for the upcoming year. Now that we have all of the infrastructure in place, we have determined that our main focus in 2018 is weed management. We are purchasing a new cultivation tractor from friends down the road and a couple implements for this tractor that will help us manage the weeds in a more timely and mechanized fashion - aka less time weeding by hand. Woohoo! As many of you know, it's incredibly dry in Southwest Colorado. We haven't received a real snow storm as of yet... and it's December 18th?! This is alarming and very worrisome. As farmers in this part of the country, we rely on snowpack for our irrigation water come spring. Currently there is very little, or no snowpack up high so... we're patiently waiting and trying not to freak out. We have talked about our 'drought plan' for next season if that is needed... but hopefully enough moisture falls before Spring so we do not have to initiate those plans. Oh how I want to see the fields full of lush cover crops, endless rows or brassicas, glowing lines of carrots, and oh so many rows of onions and potatoes. We're grateful to be on this beautiful piece of land and we will practice patience and develop our plans based on what Mother Nature provides. It's a good reminder for all of us that she's in control. 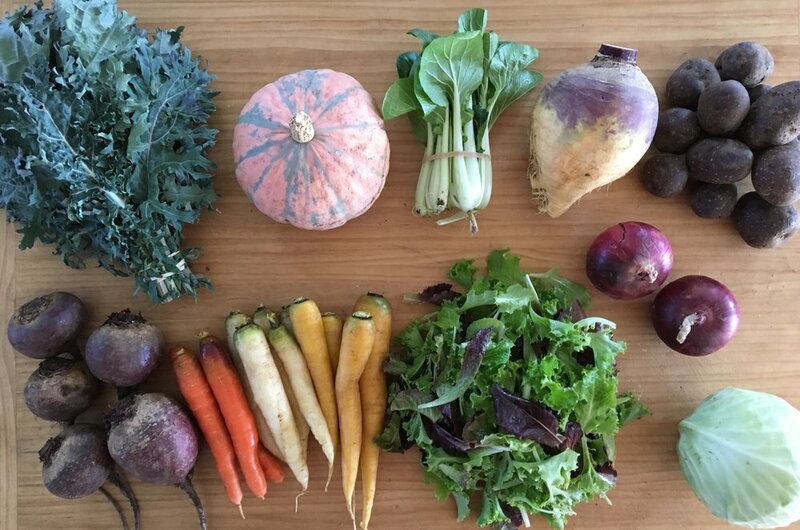 We delivered the final Fall CSA Share to our Telluride CSA Members last week! Our 2017 CSA Season was our best yet and we want to thank all of our wonderful CSA Members! We couldn't have asked for a better CSA Community this year, you're support, encouragement and enthusiasm throughout the season was amazing. THANK YOU so much for supporting us and our farm this season! Thank you for being committed to local agriculture and for choosing to join our CSA. It was such a pleasure to grow produce for you all this season and we hope we can do it for many years to come. Below is a wrap up of the last five harvests, we're pretty excited about the variety we were able to provide to both our Summer and Fall CSA Members this season. Vegetables are a source of nourishment and so incredibly beautiful, and it's satisfying to help others discover, or re-discover, this and get excited to step back into their kitchen and commit to spending time preparing meals for themselves and their families. We are excited to continue to grow our CSA Community and hope you will join us again next season! Mark your calendars, we will open Registration for the 2018 Mountain Roots Produce CSA on Thursday, February 1st! Until then... we hope your holiday season is lovely and that you get to spend quality time with friends and family. Sending best wishes to everyone for a wonderful New Year! We planted garlic last week and prepped the farm for rain and a couple cold nights. Temps here dropped down to 20 degrees and thick layer of frost covered the farm yesterday morning. The rain missed us though, which is a bummer, we were pretty excited for some moisture and muddy conditions. Oh well, I think the storm went north. The next 10 days look pretty mild, which does make growing Fall greens easy peasy. I think we will be harvesting the outside greens for another week or two and then we'll start picking off the greens in the tunnels. Mike is in Albuquerque for a few days attending the National Young Farmer's Coalition (NYFC) Convergence with farmers from all across the country. NYFC has 36 chapters and the leaders and/or representatives from each of those chapters gather at the Convergence to network, connect and share ideas, learn organizing and advocacy skills, work on farm bill and state policy, and much more. I'm excited to hear all about it when he gets home! 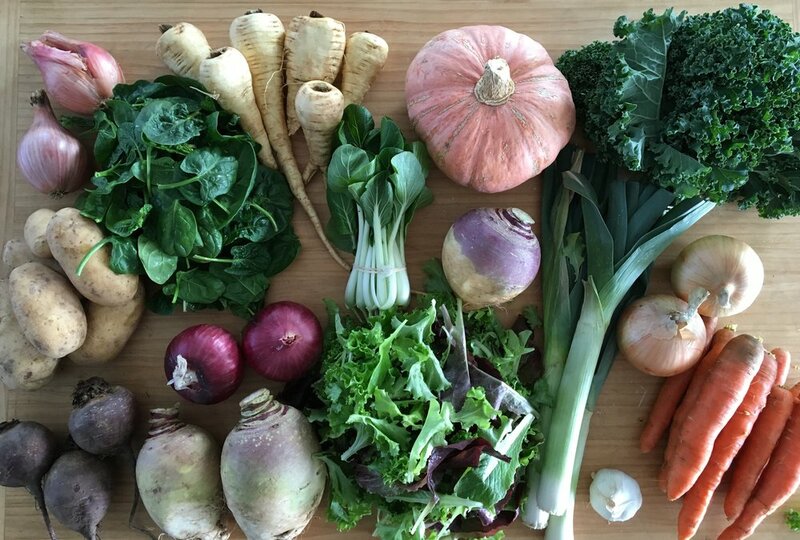 Harvest Details for Fall CSA - Week #5: Little Gem Lettuces, Kale, Napa Cabbage, Carrots, Beets, Gilfeather Turnips, Leeks, Onions, Garlic, Potatoes and Hubbard Squash.